Morgaine is a frequent media contributor in print, radio and TV. A number of her academic food research papers have been published. She is a guest lecturer at Nottingham Trent University, UK, UCL, UK and Lund University, Sweden. Morgaine is on the reviewing panel for the International Food Design Conference and yearly academic journal. As part of the EU Commission, Morgaine is the chair at the Brussels Parliament for 2015. An insightful, charismatic and credible food futurologist who is able to move perspectives of her audiences via strong facts, reasoning and engaging style- that’s the sentence I would use to describe Dr. Morgaine as a speaker and professional. As a person she carries a creative spark that makes her a truly interesting and inspiring character. Having hired Dr. Morgaine for an ideation day to craft our strategic plan for the coming 3 years, she added tremendous value to the day via her key note address on the future of our category, active participation in the crafting of ideas and also judging of the final ideas presented. 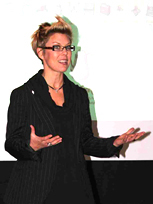 Dr Morgaine Gaye is a brilliant communicator, she is knowledgeable, warm and able to deliver her subject in an interesting way that makes the room fizz with the energy you get when an audience is receiving the right information from the right speaker. She has the knowledge and experience to deliver a wonderful experience for the audience every time and we are very pleased to be able to work with her.